The wet and dry vacuum cleaner can be a real help not just in the workshop but in the household, basement, garage or car. These appliances are mainly used when there is a need to remove liquids or wet dirt. For cleaning the car in winter, a clogged rain gutter, or even for clearing up after a party or an overturned bucket – the wet and dry vacuum cleaner is a handy help. Thanks to the additional blowing function, the Einhell appliances can also tackle hard-to-reach areas, corners and angles. 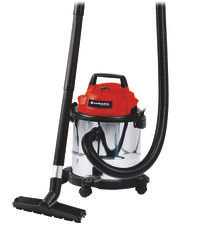 Wet and dry vacuum cleaners enable germ-free cleaning and are therefore also recommended for allergy sufferers.